Sometimes the best Haberdashers are in your own backyard! I recently discovered Bedford and Broome, a New York based team turning out some truly original, handmade men's accessories. Their name comes from their shop on Bedford Avenue in Brooklyn and their offices on Broome Street in SoHo. "Bedford Avenue is full of artists, musicians, designers, and professionals, all wearing their person style proudly. Broome Street is thriving with professionals, shoppers, and dapper gents, all dressed to impress." The combination of the two means some seriously savvy style accessories (try saying that five times fast). This bow tie and pocket square were made from two different fabric sewn together and can be tied in a handful of ways to feature each one. 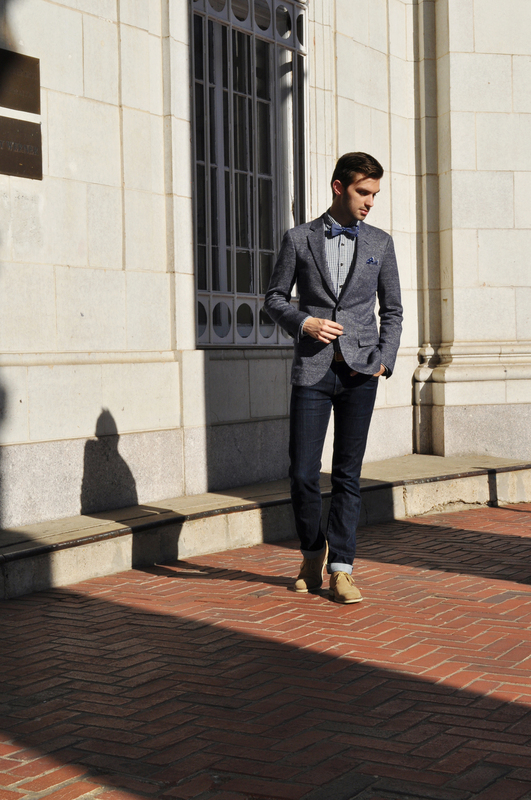 You can have a chambray bow tie, a polkadot bow tie, or a combination of the two. Same goes for the pocket square! I grabbed myself a matching tie too because I just had to complete the set. They have a whole range of bow ties and pocket squares that are multi-functional and each item is numbered and made completely by hand. It all pretty awesome. Check out their hashtag #wearyourself to see some other dapper gents rocking Bedford and Broome ties.